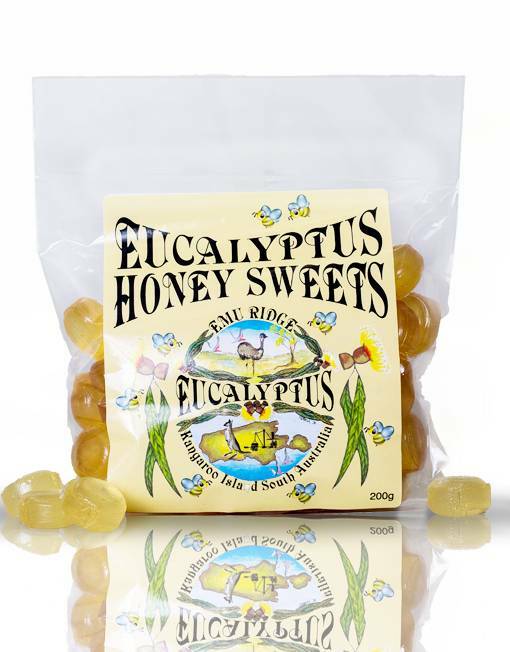 Eucalypt Day is an initiative by Eucalypt Australia to continue in its quest to raise awareness of eucalypts and celebrate the important place that they hold in the hearts and lives of Australians. 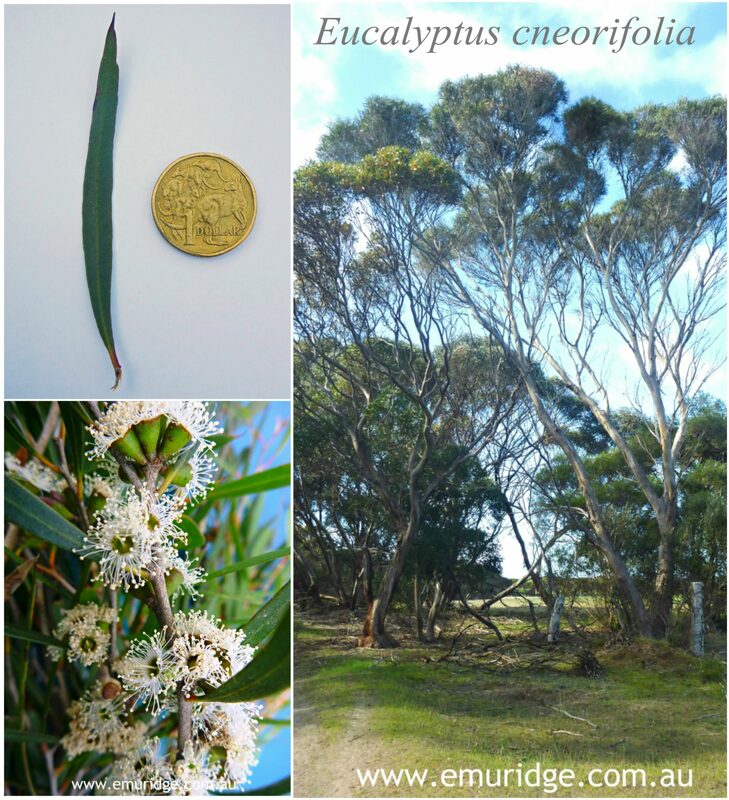 Eucalypts even have their own national day — on March 23. Eucalypts are the tallest flowering plant on Earth. Eucalypts give Australia much of its colour and smell. Eucalypts demonstrate what makes Australian environments efficient. Eucalypts are the great survivors. Eucalypts are the greatest recyclers of CO₂ and key to how this continent responds to greenhouse gas emissions. You’d be hard pressed to go more than 10 minutes without spotting a eucalyptus tree in Australia. They dominate our landscapes from the bush to our backyards, paddocks, parks and pavements. They are extraordinary plants and many people love them. One of those people is botanist Pauline Ladiges. The world expert has been studying this iconic group of plants for the past 55 years. “The most interesting thing for me is the diversity of the whole eucalypt group and its extraordinarily ancient history,” said Professor Ladiges from the University of Melbourne. So how much do you know about this iconic plant? Let’s take a closer look. The term eucalypt — meaning well (eu) covered (kalyptos) — was first coined by French botanist Charles Louis L’Héritiert de Brutelle in 1788. 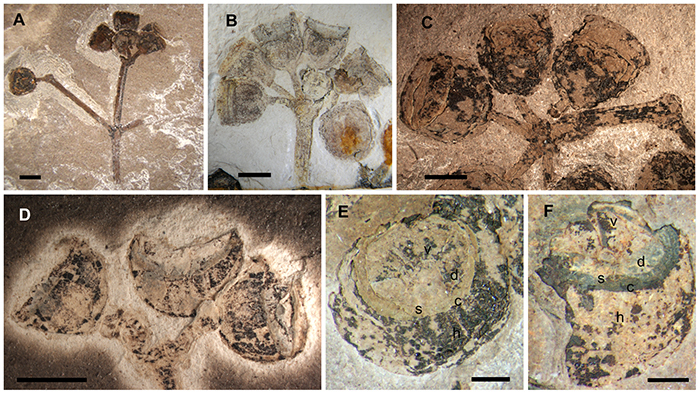 The oldest known examples of eucalypt fossils are 52 million-year-old flowers, fruits and leaves found in Patagonia. 52 million-year-old fossils of eucalypt fruits. “There are some superb fossils that I don’t think anyone doubts that have been described from South America,” said Professor Ladiges. “The eucalypt group has to go back beyond that [age] because the fossils are so recognisable. Sequencing of the eucalypt genome from the rose gum (Eucalypt grandis) — a species found in coastal areas of New South Wales and Queensland — indicates the group goes back at least 109 million years. At that time, flowering trees were starting to take off and dinosaurs roamed the land. Today, botanists have identified around 900 species of eucalypts divided into three different groups: Eucalyptus, which make up the bulk of the species; Corymbia, the bloodwood eucalypts mainly found in the north; and Angophora. Eucalypts come in all shapes and sizes and dominate the landscape from alpine regions to the outback and edges of rainforests. There’s the mighty mountain ash (Eucalyptus regnans), the world’s tallest flowering tree; the gnarly snow gum (Eucalyptus pauciflora); the multi-stemmed bull mallee (Eucalyptus behriana); the apple or cabbage ghost gum (Corymbia flavescens) found in northern Australia; and the twisted Sydney red gum (Angophora costata). “The only place they don’t really dominate is the very, very arid parts of Australia,” Professor Ladiges said. But while we think of eucalypts as being uniquely Australian, there are also a handful of species in New Guinea, Timor, Sulewesi and even one species — the rainbow gum (Eucalyptus deglupta) — on the Philippine island of Mindanao. One of the most distinctive features of eucalypts is their bark. Some trees have smooth bark — as the tree grows it sheds old layers from its trunk or branches. The new bark underneath is often brightly coloured that fades over time. There are also half-barked trees that have thick bark around their trunk but smooth limbs. “In some areas where a fire might be more like a grass fire, a lower storey fire, you’ll find trees there that only have rough bark at the base,” Professor Ladiges said. Other trees are completely covered in rough bark. The old layer of bark stays attached to the tree and forms a thick protective layer against fire. Rough barks can be a bit trickier to identify because the texture can take different forms. If the bark has long stringy bark, it might a stringybark, if it has tough, blackened furrowed bark it might be an ironbark, and if it has really short fibres it might be a box or a peppermint. But beware: not all trees with stringy bark are actually stringybarks, said Professor Ladiges. There are about 30 species in eastern Australia that can be classified as stringybarks, but she said the word gets used for similar species that are not closely related. The Darwin stringybark (Eucalyptus tetradonta) used in Aboriginal bark paintings in the Northern Territory is one of these false stringybarks. Indigenous people across Australia also use bark to make canoes and shields. 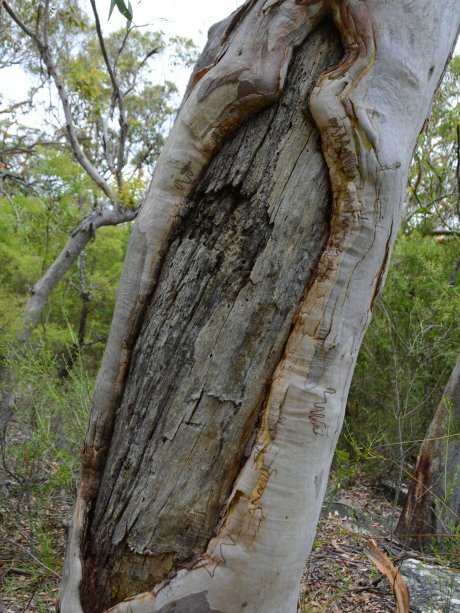 In New South Wales, Victoria and Queensland there are a number of protected scarred trees. As the name suggests these trees bear scars from where the bark was cut away and sometimes engraved. Leaves from the lemon-scented gum (Corymbia.citriodora) which is native to north Australia. 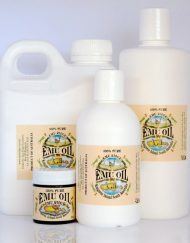 A eucalypt’s leaves are packed with oil glands that produce the aromatic compounds that give us their distinctive scent. 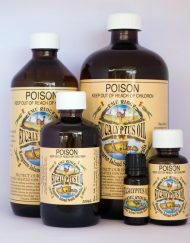 “Some smell very strongly eucalyptus-like, some smell really like peppermints, and the lemon-scented gum has a more lemony smell,” Professor Ladiges said. 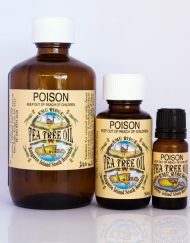 These compounds help protect the tree from attack by pests. “Oil glands make them unpalatable to insects, but then you get insects that adapt to eating those sorts of leaves,” she said. 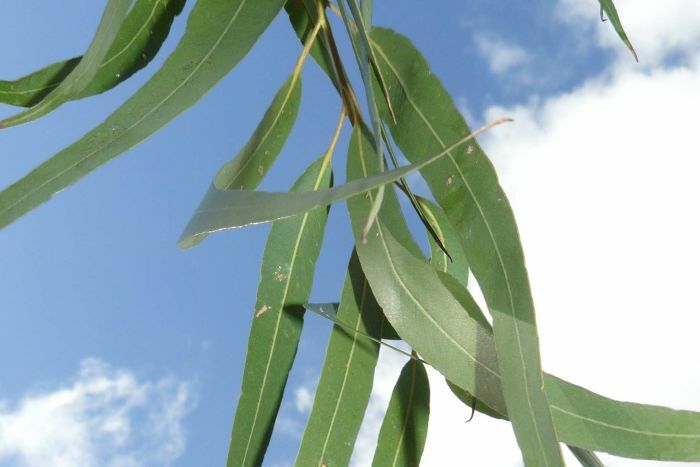 In 2013, biologists discovered that a yellowbox tree (Eucalyptus mellidora) in sheep paddock in New South Wales could change the smell of its leaves from one side to the other to protect itself against attack. 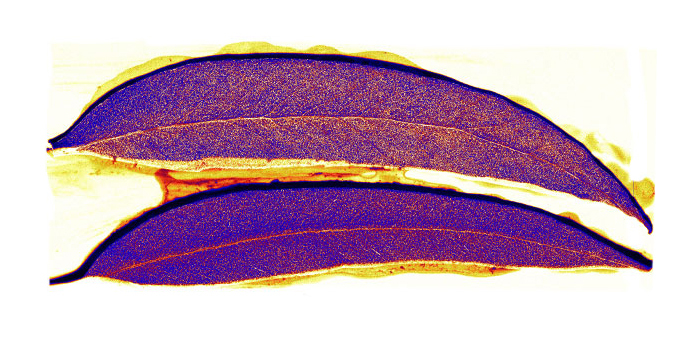 Scientists also discovered the leaves of trees in Kimberley contain microscopic traces of gold, using sophisticated imaging techniques. Eucalypt leaves also change over a tree’s lifetime. The leaves of a young sapling are held horizontally to maximise the surface area for gathering light. As the tree ages, the stalk of the leaf twists so that the leaf becomes vertical and is not exposed to as much radiation. But it’s not just the shape that changes, the structure changes, Professor Ladiges said. “The anatomy inside changes. Instead of having an upper and lower surface both sides will have photosynthetic tissue,” she said. This enables the leaves to maximise photosynthesis and minimise exposure to heat. 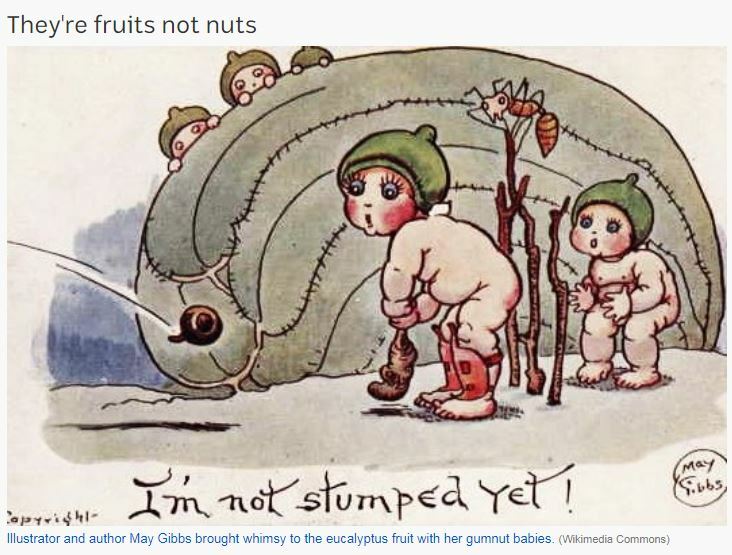 May Gibbs is a favorite author of mine, her Gum nut babies were ahead of their time soo cute! It doesn’t have the same ring to it, but Snugglepot and Cuddlepie are technically gum-fruit babies. “People call them gumnuts but they’re actually capsules which means that they open by valves at the top of the fruit. These valves dry up and open up and seeds drop out,” Professor Ladiges said. 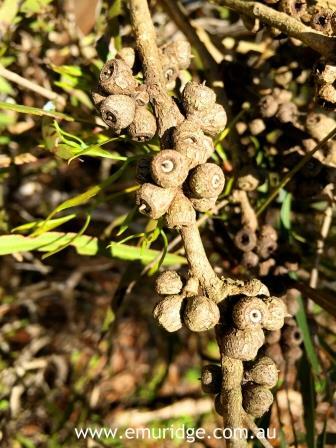 These hard, woody capsules have a thick wall, which is not destroyed by heat. The capsules open up after fire to release the undamaged seeds. Professor Ladiges said the shape and number of these capsules is distinctive from species to species. 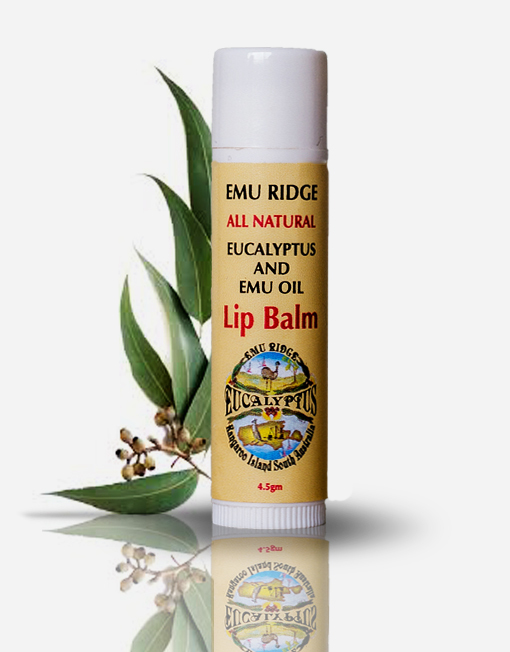 Features such as oil-filled leaves and bark that can easily shed make eucalypts highly flammable. This ability to stoke a fire is part of their survival strategy, said Professor Ladiges. 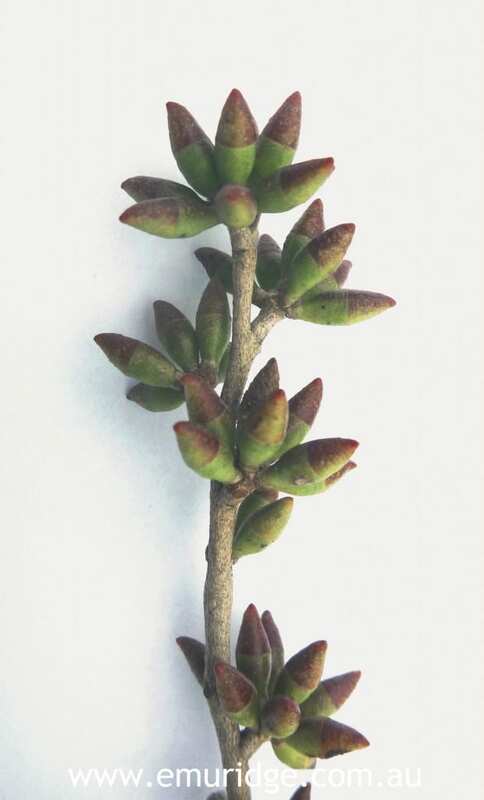 Even if the tops of the trees are destroyed by fire, many species can re-sprout from buds under their bark or from a lignotuber at the base of the tree. But not all species can re-sprout. Alpine ash forests in the Victorian Alps after fire. A handful of species only regenerate from seed, which makes them very vulnerable to frequent, high intensity fires. These species include the mountain ash (Eucalyptus regnans) and alpine ash (Eucalyptus delegatensis) in the Australian alps, and a group of species such as the salmon eucalypt (E. salmonophloia) in Western Australia’s wheatbelt. Many species of eucalypts ooze thick, red resin known as kino. 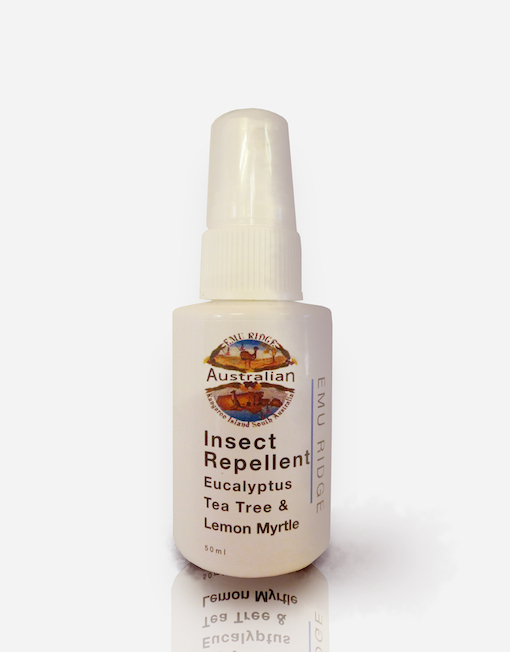 Recent research based on two Queensland species, the lemon-scented gum (Corymbia citriodora) and cadaghi gum (Eucalyptus torelliana), has shown eucalypt resin has antibacterial properties. Resin has been traditionally used by Indigenous Australians to treat cuts and wounds. 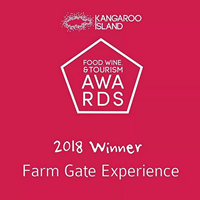 While the most famous eucalypt-muncher is the koala, kino is an important food source for the yellow-bellied glider (Petaurus australis), a small tree-dweller that lives in the forests of eastern Australia. 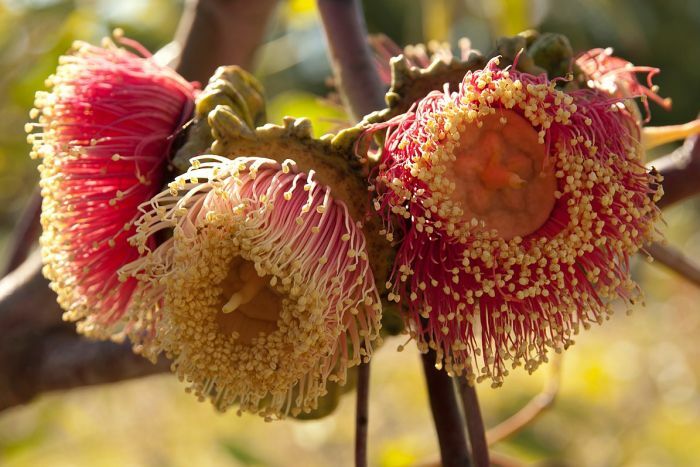 Eucalypt flowers have evolved to attract specific pollinators. Most eucalypts flower in summer, Professor Ladiges said. 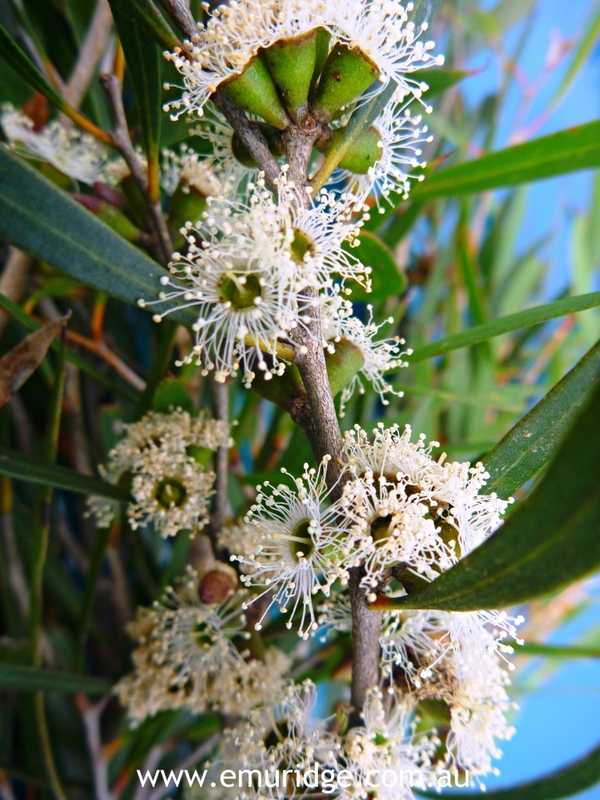 Manna gums flower in summer. “If you went down the coast now in Victoria you’d have messmate (Eucalyptus obliqua) and manna gums (Eucalyptus viminalis) flowering. And they’re basically pollinated by insects,” she said. 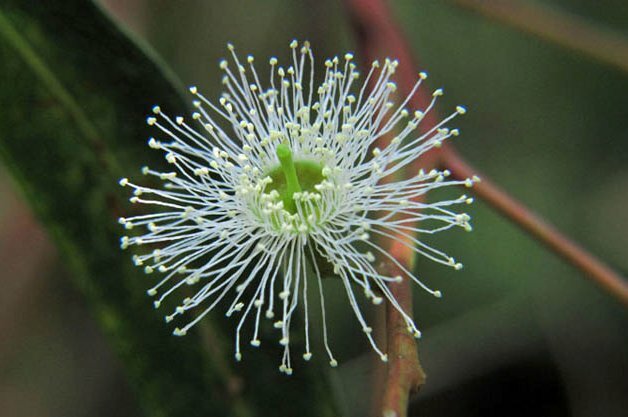 While these species of eucalypts have pale coloured flowers, others such as the Darwin woollybutt (Eucalyptus miniata) and the large-fruited mallee (Eucalyptus youngiana) are more brightly coloured. These species flower in winter and are pollinated by birds. The flowering cycle also differs between species, with some flowering longer than others. 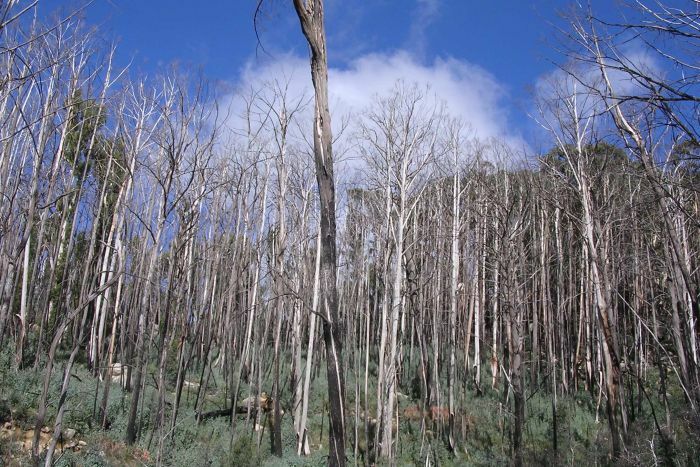 Some alpine ash eucalypts in the Australian alps are also starting to flower early in response to recurrent fires, Dr Bowman said. There are so many different species the best way to identify different species is to get a field guide for the local area, Professor Ladiges said. While it may not help you put a name to the plant sitting on the verge outside your house, it will help if you go bush. So go out bush and get closer to this iconic — and extraordinarily ancient — Australian.